“We, domestic workers are back again, this time for another ILO Convention to protect us against violence and harassment in the workplace. The invisible violence that we must bear in our work places as women and as workers is one of the most pervasive injustices inflicted into our sector but we are here to make sure this will come to an end”, said Myrtle Witbooi. 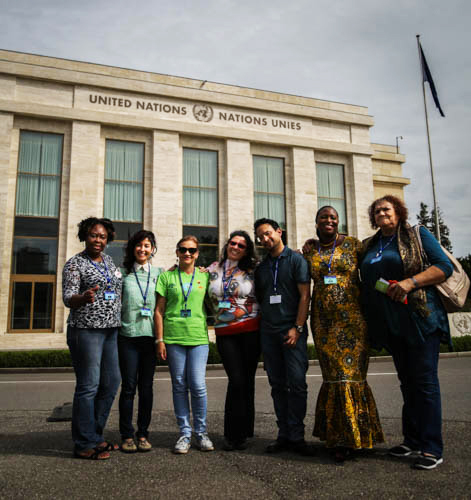 A 15-strong domestic workers world-wide leaders delegation (from Latin America, North America, Asia, and the Caribbean) led by Myrtle Witbooi, President of the IDWF, is at the 107th session of the International Labour Conference, Geneva today and this week. “We, domestic workers are back again, this time for another ILO Convention to protect us against violence and harassment in the workplace. The invisible violence that we must bear in our work places as women and as workers is one of the most pervasive injustices inflicted into our sector but we are here to make sure this will come to an end,” said Myrtle Witbooi. Members IDWF and WIEGO delegation. Domestic workers around the world unanimously welcome the proposals for an ILO Standard against violence and harassment in the world of work. The IDWF stands in solidarity with all workers, most especially those who are marginalized in the informal economy and therefore most at risk of abuse, intimidation and exploitation such as waste-pickers, street vendors, and home-based workers. We are especially happy that many governments already agree that the new ILO Standard should be a Convention supported by a Recommendation. A Convention is needed to send a strong message to the world that such abuse must end. In 2011, the ILO passed a most significant milestone when it adopted Convention 189 and Recommendation 201 to promote decent work for domestic workers. This includes measures "to ensure that domestic workers enjoy effective protection against all forms of abuse, harassment and violence" (Article 5). However, to help protect domestic workers, the proposed Standard must contain certain provisions which might otherwise be overlooked or kept weak. This includes private households as a workplace, and private employment agencies as an employer. We are very pleased to see that the ILO Report V (2) 'Ending Violence and Harassment in the World of Work', 7 March 2018, agrees to both of these. The IDWF has been working and preparing for this International Labour Conference for over two years. It surveyed its affiliates to understand the national situations. During April and May of this year, affiliates from Africa to Asia, to Europe and to the Americas and the Caribbean regions gathered at regional workshops to share stories, discuss strategies and plan for actions to tackle this issue in their countries, and at international level. Specifically, to the ILO process, it documented responses from its affiliates in reply to the ILO Questionnaires. As a result of these consultations, IDWF has produced a “Platform of Demands” featuring the issues domestic workers deem most vital in this discussion. 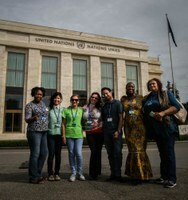 In this week, the IDWF delegation will work alongside workers leaders of other informal economy sectors in the WIEGO (Women in the Informal Economy: Globalizing and Organizing) delegation and other trade unions to make history in the international labour movement to assure safe work environments free of harassment for all workers. The International Domestic Workers Federation (IDWF) consists of 67 affiliates in 54 countries, representing over 600,000 domestic workers worldwide. Equal Rights, Respect & Justice for Domestic Workers! !